(Newser) – A 4-year-old child died after being pulled unresponsive from a swimming pool on a Norwegian Cruise Line ship off the coast of North Carolina yesterday, cruise line and Coast Guard officials said. Crew members were able to revive a 6-year-old boy also found in the pool. He was airlifted to a hospital, where his condition was unknown. 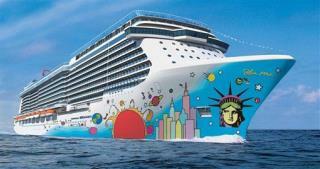 The two children were found in the morning on the Norwegian Breakaway, the cruise line said in a statement on its Facebook page. And where were the parents?? Seems like the Newser Editors really let their readers down this time, by NOT collecting all the facts before reporting to the public. Are not the "Editors" responsible for editing the news content before publishing it? Newser management should do something to improve the quality of the published stories! Maybe think about hiring more experienced writers, rather than a college aged interns that write they're lame inexperienced opinions.....rather than reporting the facts!! Anyone who has been on a cruise know that parents pay no attention to their rug rats and let them run around annoying other passengers. Who was watching this kid? At that age someone should have been, but obviously weren'tt It's you kid, YOU watch it.. US law will apply and SCOTUS has ruled that pool operators only need to put up a single sign that reads, "Swim at own risk."